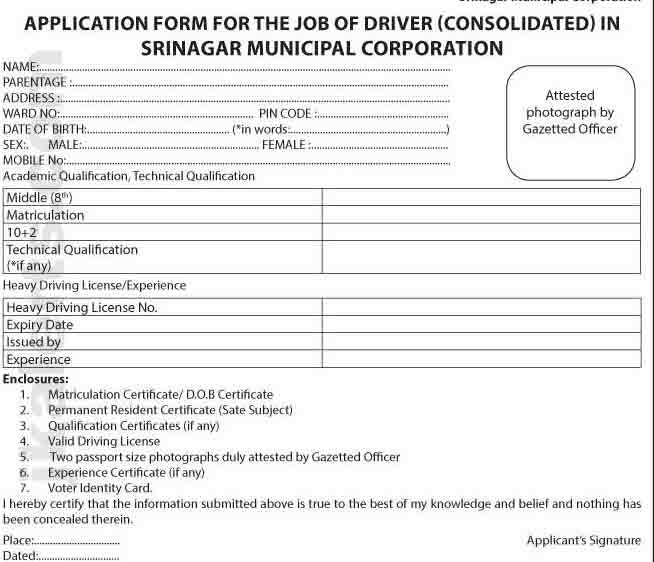 Srinagar Municipal Corporation SMC Srinagar Recruitment 75 Driver posts. In the latest Employment Notices for SMC Invites applications for the post of Driver. 2. 2 years minimum driving experience. 3. Minimum qualification Matriculate/Middle Pass. 1. The Need Base Drive will be engaged for a period of 6 month in the first instance. 2. The Need Base Driver service may be extended if needed subject to approval is accorded by the Administrative Department. 3. The Need Base Driver engaged shall not claim for their regularisation. 4. The engagement of Need Base Driver shall be terminable at any point of time. The applicant should be within the age group of 18 to 33 years as on 01.01.2018. Applications duly complete in all respects and accompanied with attested copies of the below mentioned documents can be submitted in Central Office, SMC in the office of Executive Engineer (Mech.) by or before 25.06.2018 (upto 4.00 pm). 1. Date of Birth Certificate (School Leaving Certificate). 2. Permanent Residence Certificate (State Subject). 3. Academic Qualification Certificates/ Marks Certificates (if any). 4. Valid Driving License (Heavy Motor Vehicle). 5. Two passport size Photographs duly attested by Gazetted Officer. Note: Any application received prior to this notice shall stand cancelled and all those persons shall submit fresh application against this advertisement.